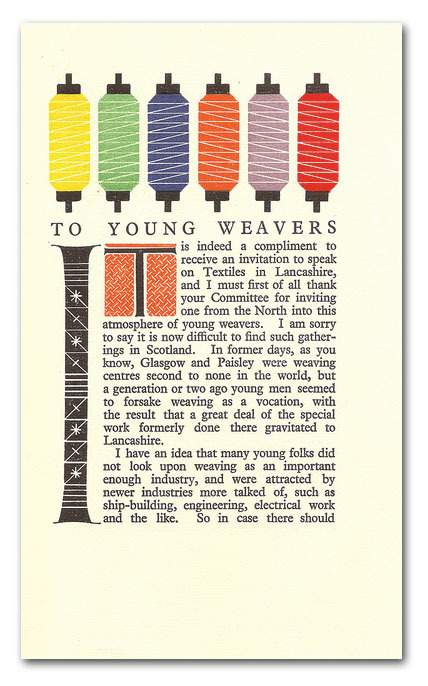 A wonderful booklet issued by Morton Sundour, a famous British dying and cloth company based in Carlisle and who were well-known for the quality of their publicity. This booklet was the text of a speech given by James Morton in Manchester in 1927 which was illustrated by Charles Paine (1895-1967), an artist who did many posters for clients such as London Transport. Beautifully printed by The Baynard Press in 1927. One of the nicest chapter openings I have seen in a while. ::Thanks to Mike Ashworth for sharing! Is There Anything Ferrer Cannot Do? Who Knew Reading was a Competitive Sport? Grounds For a Makeover at Starbucks?